There are many good reasons why you should secure your medication. First of all, it will prevent curious young children from getting their hands on them. Another reason could be that you don’t want the risk of mixing your medication with your family member’s medication. It could also be of privacy concerns or simply because it’s a great way to organize your meds. With that said, there are many lock boxes to choose from that can help you with this. Few are great, some are decent, and a whole lot of them are (to put it lightly) horrible. We are concerned about keeping medication secure and so should you be. That’s why we have put together this article with reviews of the best lock boxes for medication storage in 2019! Top 5 Best Lock Boxes for Medication Storage in 2019! 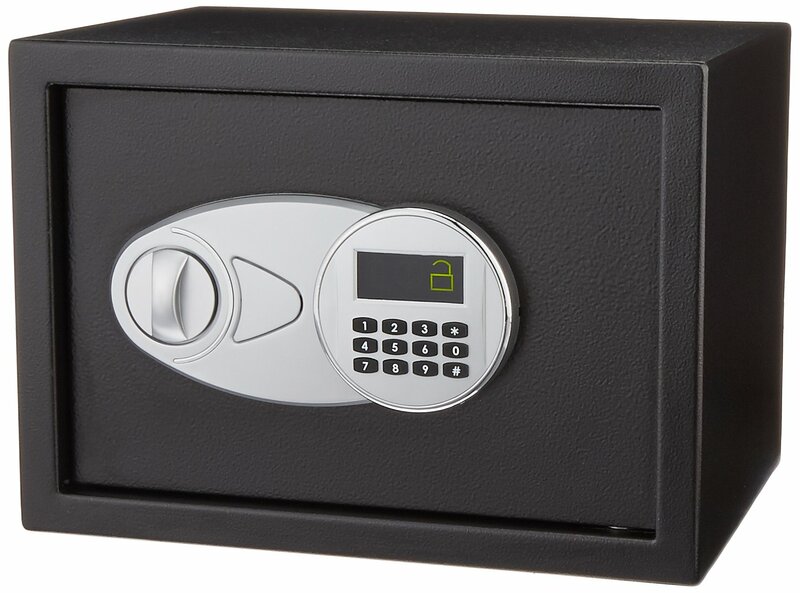 Our first choice is the extremely popular and versatile AmazonBasic Security Safe. This “lock box” is mainly used to accommodate common household treasures. We are talking money, photo albums, passports, electronics, and jewelry to mention a few. It’s also the PERFECT storage solution for your medication! Security wise, it’s made out of steel, has concealed hinges, and features two steel locking bolts. The exterior is, with other words, rock solid and the door is pry-resistant. The interior, however, is soft and will provide a great cushion for delicate items. Further, it’s equipped with an electronic lock that provides quick and easy access. It’s reprogrammable, so you can change your code at any time. If you would forget the code, don’t worry, just grab one of the two provided emergency keys to unlock the safe! Additionally, it has one adjustable shelf that can be completely removed to free up space. Last but not least, it has four mounting holes and comes with four bolts so you can easily mount the safe. 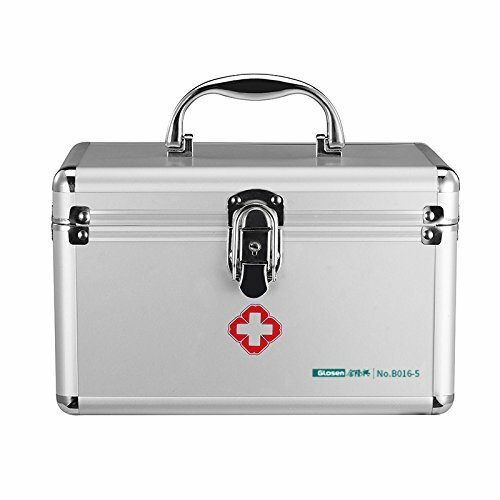 Are you looking for a lock box that was specifically designed to store medication? Check out the Medication and Prescription Drugs Storage Box by BUYaSafe. When it comes to portable medication lock boxes, this will be your best bet. The convenient carrying handle and the shoulder strap makes it ridiculously easy to carry with you. It’s a well built aluminum box and the key lock offers easy and secure access. Additionally, it comes with a plastic tray with three compartments for easy organization. All in all, a great lock box that offers a great desiccated space for your meds as well as for needles and other accessories. This lock box shares many features with the previous lock box. The Ultimateod lock box, however, will serve as a smaller and lighter option. It’s a lightweight and compact lock box made out of aluminum alloy. It has a folding carrying handle and a shoulder strap which makes it ideal for trips. Customers has reported being able to fit 20 bottles of various sizes, so it’s quite spacious. It also comes with compartments, so you can easily organize your meds. If you are looking for a small and traditonal looking lock box, check out the MMF Fire-Retardant Steel Security Box. 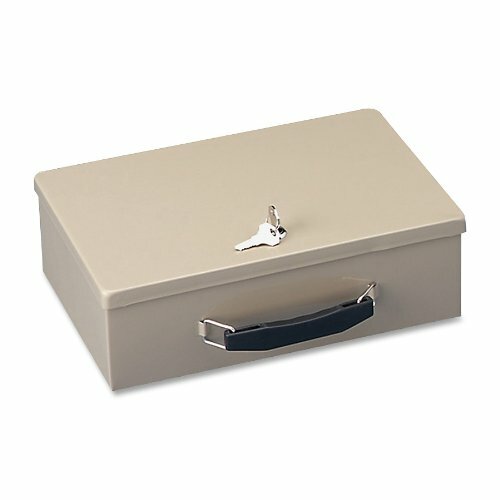 This compact lock box is perfect for storing medication, cash, jewelry, and much more! For it’s size, it’s extremely sturdy with its heavy-gauge steel exterior. It’s also designed to protect your content from fire damage with double-insulated walls. Additionally, it’s equipped with an ergonomic carrying handle that makes it easy to carry your medication with you wherever you go. Lastly, it features a sturdy key latch to prevent unwanted access to your meds. Our last “lock box” may surprise you. Yes, we are aware that it’s not really a lock box. So, what is it? 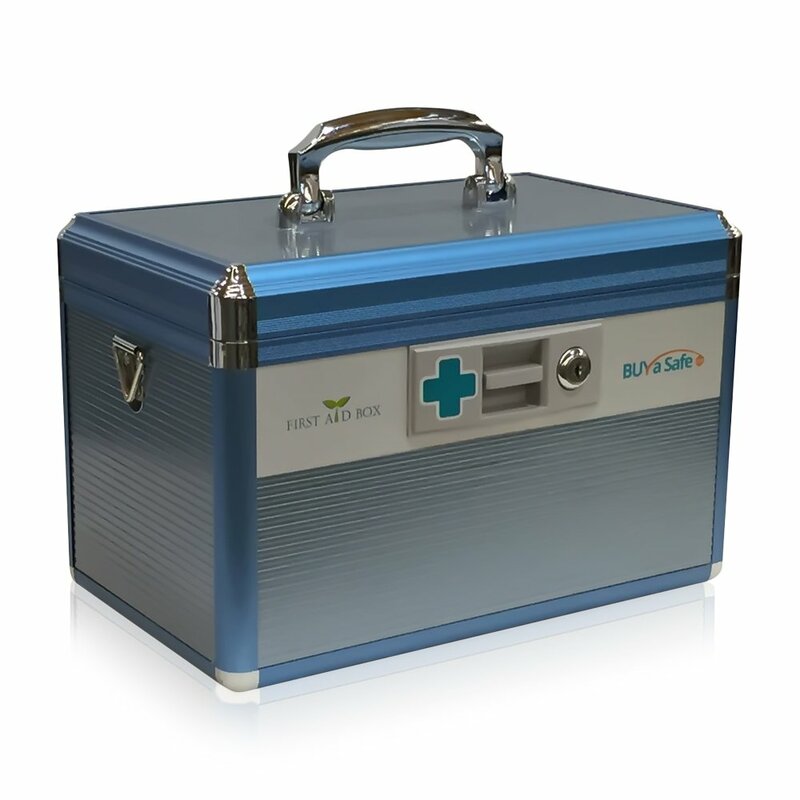 It’s a very popular alternative to a medication lock box that we simply couldn’t ignore. The Medication Bag Heavy Canvas Standard Keyed Lock Storage Case is exactly what it sounds like. 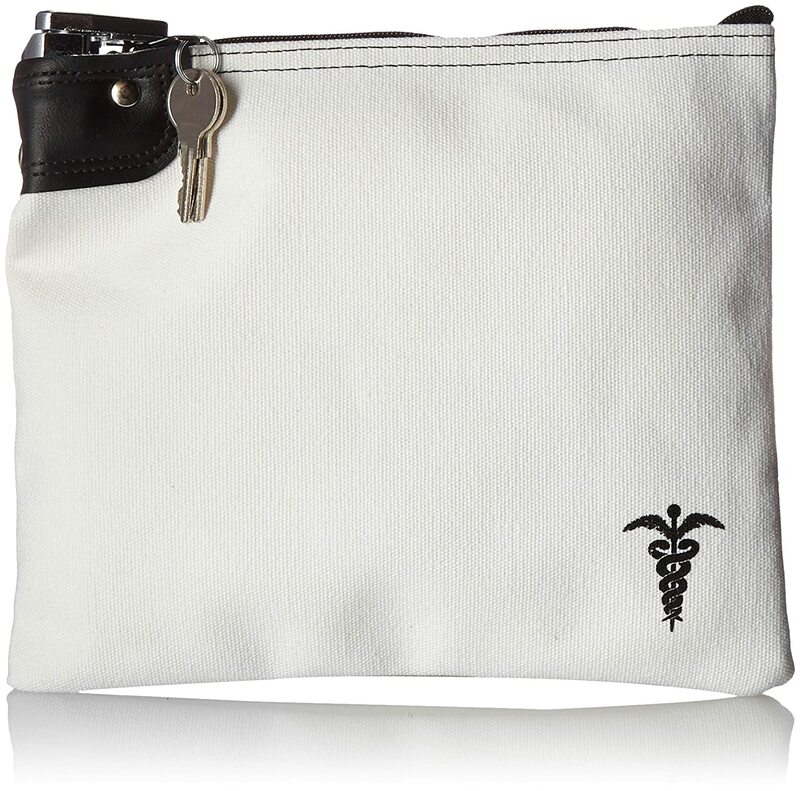 A canvas medication bag with a key lock. It’s light and has the capacity to accommodate many packages and bottles. This canvas bag may not be the ideal medication storage solution to a lot of people. But we definititely believe it can serve as a the PERFECT travel solution for your meds. It’s not rocket science to buy a lock box for medication, we know. There are, however, two factors we’d like to emphasize before you “lock in” on a lock box. Those are security and access time. Security is absolutely vital when dealing with medication. Especially if you are dealing with strong medication that would be dangerous in the wrong hands. If you decide to look elsewhere — remember to always look for a lock box made of a decent material and with a lock! Always pay attention to customer reviews as well. Access time is another factor you should consider before buying a lock box for your medication. Why? Think about it. If you use your medication on a daily basis it may be annoying to use a key. The Amazon safe we have listed at #1, is ideal if you are looking for quick and easy access. No keys required, just simply enter your code and you are ready to go. If access time is not as important to you, a normal key lock will do just fine. There you have them — five awesome lock boxes for your medication! One stationary option, three portable lock boxes, and one canvas bag. If you are looking for the best lock boxes for medication storage in 2019 you have found the right place!